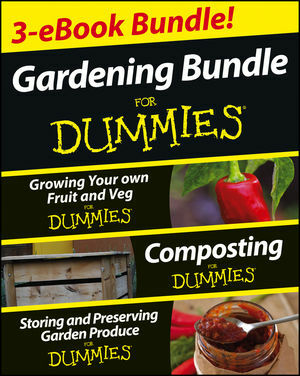 Gardening For Dummies eBook Bundle gives you three full length books rolled into one convenient bundle giving everything you need to know to help you towards a succesful crop and a full larder! Growing Your Own Fruit and Veg For Dummies is a complete hands-on guide to growing delicious fruit and veg. It gives you the low-down on everything from assessing your plot and getting your hands on the right tools, to choosing the plants to grow, to nurturing your crops and bringing in your harvest. Composting For Dummies shows you how to turn household food waste and more into free nutrient-rich compost and mulch to give their vegetable and flower gardens a boost of energy. Geoff Stebbings is a horticulturist who trained at the Royal Botanic Gardens in England and is the former Head Gardener at Myddleton House in Middlesex. He has contributed to various gardening publications, such as the journal of the Royal Horticultural Society.